I’ve just had the sad experience of reading a cheery Christmas card I sent last year to a good friend with whom I’ve been corresponding for about 15 years. Though our meeting was brief, at a conference where we were both speakers, we bonded instantly and immediately began exchanging holiday letters. We wrote only once a year, but our letters were individual, personal and long– about our writing, about our gardens and the things we were cooking. We exchanged recipes and recommendations for books to read. Last year at this time, I was looking forward to receiving her holiday letter. She was a role model for me. In her 80s, she remained vigorous and curious, working on a long book that depended on her Greek translations. She’d given up a summer place to move full-time into her primary home, but she showed no signs of mental decline. Her most recent book had been about death and dying, based on her experience with her mother. It remains on my shelf, still unread. In my Christmas card, I asked her how her new book was coming along, and conveyed to her the compliments of a friend who was enjoying a previous book she’d written. I asked about an older book of hers I wanted to locate. Why am I reading this letter again? My heart told me what that meant, but I spent considerable time online finding her address, mapping the location of her house and looking at a photograph of it, overgrown and neglected. And then I found her obituary– she had died “after a long illness.” But she had written to me the previous Christmas, filled with good cheer and encouragement. I cried for an hour. I know this woman had a daughter, though another daughter had died some time before. I know she maintained a hearty correspondence with many people and was beloved by many more who had read her books. I deeply sympathize with whatever hardships might have accompanied her illness and death. But I can’t help wishing her remaining daughter had turned to my friend’s no doubt meticulously maintained address book and to let her friends know she was ill, or that she had died. And here’s the purpose of writing about this: If a loved one in your family has died this year, please make that final effort: write to their friends. Even a postcard would do. Think of the people who, like me, are enjoying this season and anticipating that annual letter. Let them know; if you can’t bear to provide all the details of the death, at least give them the fact that it has occurred. Let that be your final gift to your dead loved one. Please, for the sake of those you loved, tell those that they cared about that they are gone. They’d thank you for it if they could. 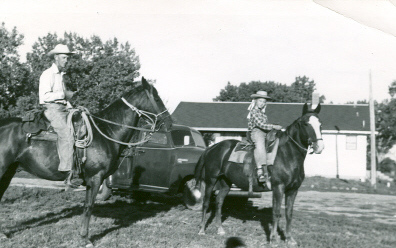 My father on Zarro and me on Blaze, 1953. Recently I gave away my saddles: my father’s old Duhamel saddle, the saddle made for me when I was twelve by a saddlemaker in Buffalo Gap, and George’s, also an antique. They went to a family in the neighborhood, with two sons and a couple of nieces who may eventually grow into one or more of the saddles. The two boys have been wanting saddles of their own but the cost simply wasn’t possible. When I showed the high school boy my father’s old-fashioned saddle, his eyes opened wide and he smiled so hard he must have strained a muscle. Suddenly I could see my father on his Tennessee Walking horse Zarro. And I seemed to see him smile at this long-legged kid, as tall at 17 at my father was as an adult. Then the younger boy took my saddle in his arms– the weight nearly felled him– and with a determined frown hoisted it over his shoulder to carry it outside. He put it down on the ground while his mother opened their car– but he put it down with the sheepskin lining against the ground. Quietly, the older boy corrected him: when you put a saddle down, you tip it over, so the horn rests on the ground, to keep from breaking or straining the tree inside and to keep the sheepskin lining clean. 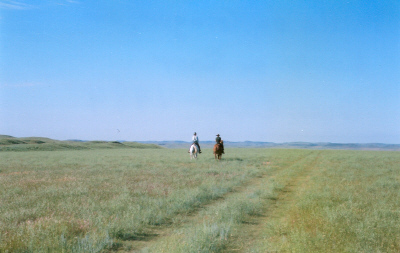 Riding on the ranch, 1984. After they left, I cried, thinking over long memories of riding with my father and George, but I smiled too, to know those saddles will be ridden and cared for by another family for more generations than I will live. Later I realized that giving my saddles away is an admission that I am unlikely to ride a horse again. Of course I didn’t ride all the time we lived in Cheyenne but I always had my saddle oiled and ready. I’d suffer plenty of muscle pain if I rode again but the worst part would be that I’d be riding a horse I didn’t train. Many of the times I’ve done that, I’ve regretted it: no one trained horses the way I learned to do from my gentle father. Horses are intelligent and sensitive and too many of the ones I’ve ridden that were owned by someone else had been treated so that they were untrustworthy. I’ve been kicked in the upper arm, thrown, rolled on. No, I’m not likely to ride a horse someone else has trained and that means I’ve given up something that was of deep importance to me. The freedom of riding a horse here on the ranch has been unparalleled in my life; the sheer joy of moving in such harmony with a horse’s muscles and mind is like nothing else I’ve ever experienced. 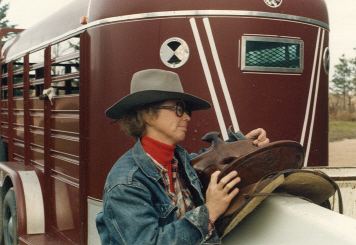 With the saddle in the 1980s. The stock trailer has been sold as well. I have made this choice many times in the past few years and giving away the saddles was making it again, more permanently. I’m nearly seventy years old but I’m not in bad shape. I could buy a young horse, train it, spend time riding. Or I could buy an older, well-trained horse and enjoy rides all over the pastures I still own. But I have responsibilities to my partner, to my dogs, to my garden and most of all to my writing. The time I devoted to riding would need to be taken from something else and I choose not to shortchange those other elements of my life. Most importantly, I’ve chosen to sit in this office chair and write about the life I lived, hoping to help inspire protection of the prairies and the ranching life so that other youngsters may know the life of freedom I knew on horseback. When the family asked if they couldn’t pay something for the saddles, the teacher in me arose. In return for the gift, I asked only that the two boys write me their thanks. I reasoned that besides providing them with good practice in writing in general and in expressing gratitude in particular, the exercise would serve as an illustration that generosity is an important part of enjoying a satisfying life. 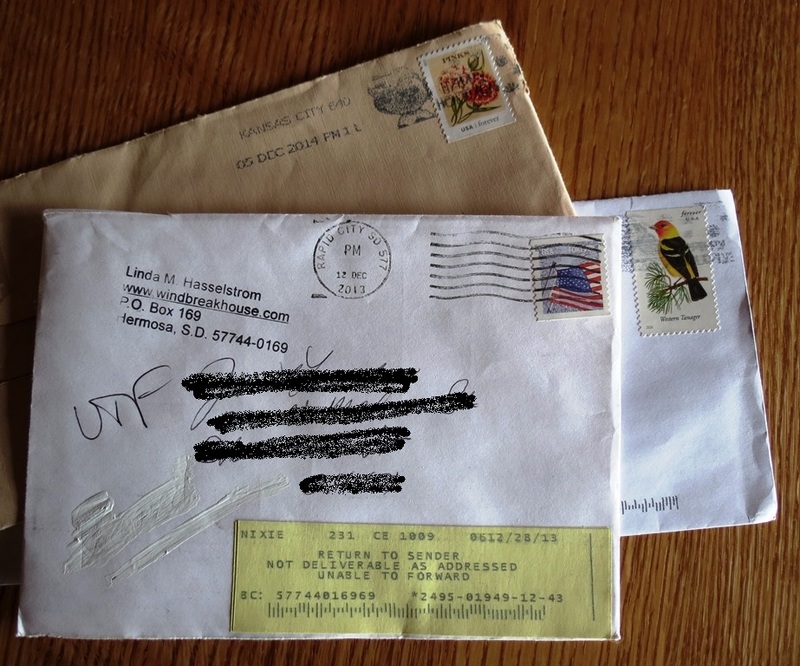 To prove my confidence was not misplaced, here are the letters I received. Linda, I want you to know how awesome it is to have a usable piece of history. Every time I use the saddle, I think about your Dad and the kind of hardworking but interesting person he must have been. Thank you for sharing your history with me! Linda, I like character. The saddle I ride has that. Plus it has a neat story. A South Dakota author grew up having adventures in my saddle. Pretty neat. Linda, Your husband’s saddle has been used by [two nieces who live nearby]. We do cherish the fact that you saw our children and extended family as keepers of your story in any form. We also love that you see them as responsible and caring enough to preserve some very fun saddles that would have stories to tell if they could talk.